How do markets react to the release of economic data? We use a set of machine learning and statistical algorithms to try to find out. In the period since the EU referendum, we find that UK data outturns have generally been more positive than market expectations immediately prior to their release. At the same time, the responsiveness of market interest rates to those data surprises fell below historic averages. The sensitivity of market rates has also been below historic averages in the US and Euro area, suggesting international factors may also have played a role. But there are some signs that the sensitivity has increased over the past year in the UK. Economic data come in many shapes and sizes. The quantity and frequency of information from around the world has increased substantially over the last few decades, with multiple releases published every day. These data releases are an important source of information for market participants in forming their views about the economic outlook. And the global nature of financial markets also means that economic developments in one country can affect asset prices in other countries too. This post uses a set of machine learning and statistical techniques to decipher how much weight markets attach to different global data releases. We use this information to aggregate the surprise component in these releases to construct Economic Surprise Indices (ESIs) for the UK, US and EA. We then analyse the behaviour of these indices to understand how markets have reacted to data releases over the recent past. How to measure economic data surprises? Macroeconomic data news can affect market participants’ views about the outlook for future growth and inflation. This can affect their expectations of the future path of market interest rates. As financial markets are forward looking, asset prices should only respond to the unexpected component of a given data release: the surprise. We measure the ‘surprise’ as the difference between the actual data outturn and the median expectation for that release from Bloomberg surveys of financial market participants which are carried out the day before. Our sample includes a range of activity indicators, inflation estimates, labour market indicators and business surveys from the UK, US, euro area and Asia. In total we consider around 140 different data series, and our sample begins in 2003. Some data releases are typically more important in determining market expectations than others. The challenge here is to select which variables have the greatest impact on market interest rates and figure out how much weight to attach to them. We then use these weights to aggregate together the various data surprise variables to construct an ESI. To select the weights we use a range of different machine learning algorithms. These algorithms apply different methods to select a set of variables and their weights based on the correlation with daily changes in interest rates. This work builds on the approaches used in Eguren-Martin and Mclaren (2015) and Swanson and Williams (2014a, 2014b), and similar indices are collated by private institutions. Table 1 provides a summary description of the different machine learning algorithms we tested. Our benchmark model is calibrated to daily changes in 3 year UK government bond yields, although we obtain very similar results using yields at shorter maturities. The bar charts show the estimated response (in percentage points) of UK 3-year rates to a one standard deviation surprise for the 10 most significant variables identified by each search algorithm. The different algorithms tend to select a similar subset of indicators. Surprises to PMI, GDP, and unemployment releases are generally significant, and several of the models also pick out a number of US, Euro-area, and Asian indicators for the UK. Surprises to US non-farm payrolls appear to be one of the strongest candidate variables across the different algorithms. Sources: Bloomberg and Bank calculations. Notes: The algorithms above were implemented in R and made use of the following open source libraries: BestGLM (BIC), GETS (GETS), GLMNet (LASSO and RIDGE), BMS (BMA), mboost (BOOST) and PLS (PLS). Each algorithm was run on the same dataset which included around 140 data surprise variables over the period January 2003 to May 2017. The charts show the top 10 variables only, other variables are excluded. It is possible to vary the parameters in several of the algorithms chosen, which can affect the results. For the remainder of this post we use the results from the Least Absolute Shrinkage and Selection Operator (LASSO) algorithm. This method selected 57 variables in total. The resulting ESI was able to explain a larger amount of the variation in UK interest rates when compared against the other algorithms. We also use the same method for constructing US and EA ESIs, again using 3-year government bond yields. How have economic data surprised markets over the past year? Chart 1 plots the UK, US and euro-area ESIs as a 12-month moving average to smooth through the daily volatility. They are highly correlated, which is unsurprising given interest rates tend to be well correlated across countries and different interest rate markets often react to some of the same variables. In general, the UK ESI places a 50:50 weight on domestic and foreign data releases, whereas the US ratio is closer to 80:20. This likely reflects the UK economy’s greater openness. Sources: Bloomberg and Bank calculations. 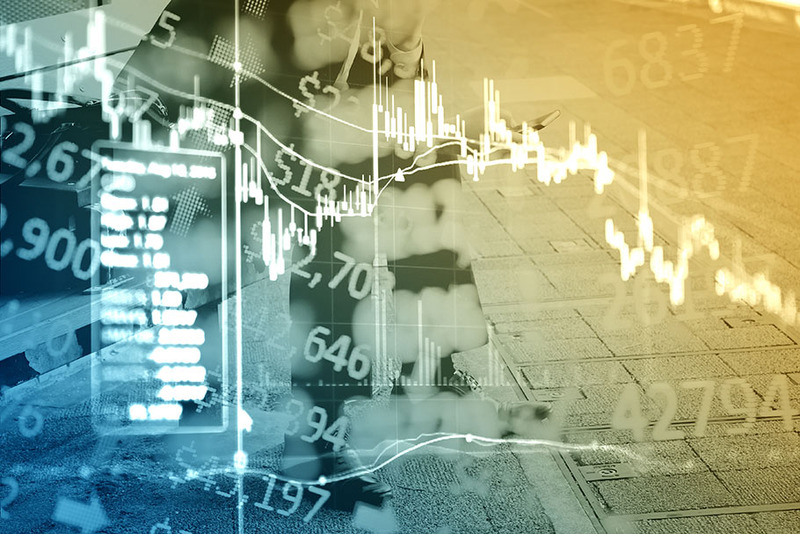 Notes: The Economic Surprise Indices weight together different data surprise variables using the algorithms described earlier. Each of these variables is standardised to have the same mean and standard deviation. Therefore the units of the final index are in terms of the number of standard deviations from average. The chart shows the 12 month moving average of the final indices to smooth through daily volatility in each series. Chart 2 looks at domestic data surprises only, and cumulates these since the start of June 2016. Economic data have generally surprised to the upside since the EU referendum. UK data news has been particularly strong relative to the EA and US. This may reflect more pessimistic expectations for these outturns from UK survey respondents following the referendum, in addition to some strong readings in the data themselves. Sources: Bloomberg and Bank calculations. Notes: The Economic Surprise Indices are composed of both domestic and foreign data surprises. This chart shows the domestic surprise component only, and cumulates these surprises since the 1 June 2016. How have markets reacted to these data surprises? It is also possible to examine how the sensitivity of interest rates to data surprises has evolved over time. Chart 3 plots the 12-month rolling sensitivity of UK 3-year government bond yields to our UK ESI, showing the rolling regression coefficient along with the rolling R-squared. It therefore illustrates how the sensitivity of UK 3-year government bond yields to our ESI has evolved over time, and how well the ESI helps to explain movements in bond yields. Looking over the recent past, the sensitivity of UK rates started to fall prior to the EU referendum. This fall coincided with the depreciation in sterling at the end of 2015, as markets began to price in uncertainty around the potential outcome of the referendum. The sensitivity also fell further after the referendum result. Having been able to explain around 10% of the variation in market interest rates since 2004, data surprises explained less than 2% of the variation in the period immediately after the referendum. This may have been consistent with markets taking a more pessimistic view of the UK’s growth outlook due to uncertainty around future trading arrangements. As a result, investors may have been placing less weight on near-term positive data and more weight on political developments and monetary policy communications in determining the outlook for UK rates. Indeed, there have been several other events that have caused UK rates to move over this period. 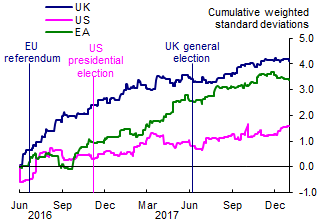 For example, UK rates increased in the weeks following the October 2016 Conservative Party Conference and there were also notable moves around the UK and US elections, as well as following recent monetary policy communications. 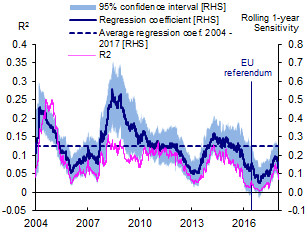 But there are some signs that the sensitivity of UK rates to data surprises has started to increase towards average levels more recently, as shown in Chart 3. Sources: Bloomberg and Bank calculations. Notes: This chart plots the coefficient estimates and R2 values from rolling 12 month regressions of 3 year interest rates on the UK Economic Surprise Index. The 95% confidence intervals are shown by the swathe around the coefficient estimates. The recent period of low sensitivity was not just a UK story. 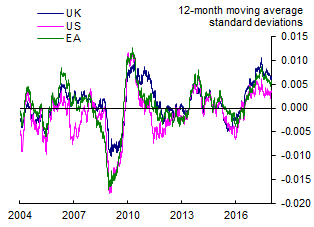 Chart 4 plots the same 12-month rolling sensitivity but compares the UK, US and euro area. The sensitivity across these regions remains below historic averages. An important reason behind this is likely to be the low level of interest rates and proximity to the zero lower bound (ZLB). In the euro area, the fall in the sensitivity coincides with July 2012 remarks by President Draghi that the ECB would be “…ready to do whatever it takes to preserve the euro” and subsequent policy easing. The picture is less clear in the US. Swanson and Williams (2014a) found that the ZLB began to constrain the sensitivity of short rates to macroeconomic news from late 2011, following the FOMC’s forward guidance. 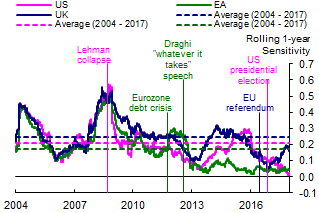 And, as shown in Chart 4, the sensitivity of US, and UK, rates began to increase again from late-2013, as expectations of monetary policy normalisation started to build. The more recent decline in the sensitivity of US rates to data surprises is more puzzling, particularly because the FOMC has started tightening monetary policy, moving rates away from the ZLB. It may be that US investors have been more focused on the implications for interest rates of political events such as the 2016 US presidential election, rather than news in economic data releases. The strong correlation between UK, US and euro-area bond markets means that these international factors are also likely to have played a role in influencing the sensitivity of UK market interest rates to economic data over the past, and are likely to continue playing a role going forward. Sources: Bloomberg and Bank calculations. Notes: This chart plots the coefficient estimates from rolling 12 month regressions of 3 year interest rates on the UK, US and euro-area Economic Surprise Indices. The blue line is the same as in Chart 3. Jeremy Franklin, Scott Woldum and Oliver Wood work in the Bank’s Macro Financial Analysis Division. Alex Parsons works in the Bank’s Market Intelligence and Analysis Division. Next Post Trimming the Hedge: How can CCPs efficiently manage a default? I would assume that one of the most important data sets now influencing UK interest rates would be the PMI data. This data does not go back to 2003 and seems to be ignored by the machine learning algorithm (table1). Very interesting post. In order to explore this promising area further. Is the data and/or code you have used for this analysis available somewhere? Many thanks for a good and well updated blog.